What happens to businesses and communities when high speed internet comes to town? Businesses accessing the internet is nothing new. In the 70s and 80s, banks and Wall Street began changing the way they shared information. Back then internet related tasks only required a simple modem and dial-up connection. Today’s demands, however, require much faster, reliable systems and internet connections. Business owners and Information technology professionals have a lot to choose from. But what does that mean for their business, and how do they know which to choose? Business high-speed internet can lead to greater advantages for companies that rely on cloud-based apps and data. According to a study conducted by the Analysis Group, a city with high-speed internet, over a gigabit connection, has an overall healthier economy. The researchers took federal statistics comparing 14 metropolitan areas where more than half the population had access to high-speed internet to 41 neighboring cities without high-speed internet. 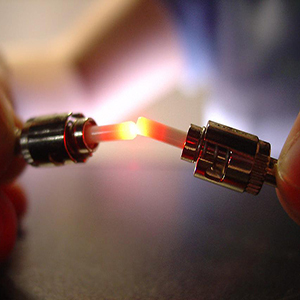 It was reported that cities with gigabit connections, like the one’s fiber optics, can support a 1.1% higher gross domestic product than other “slow internet” cities. A 1.1% difference might not sound like a lot, but when compared with the United States overall GDP, which grows at 1-2% percent a year, you’ll see how this can significantly impact economic growth. It could means up to an extra $1.4 billion in the local economy. But when high-speed internet comes into an area, change doesn’t happen overnight. Patrik Regardh, head of strategic marketing for Ericsson, says the positive effects of these new technologies may be hard to see right away. As more and more businesses have access to faster internet though, whole verticals of the economy will transform.